"I believe that Arsene Lupin and Sherlock Holmes shall meet again some day. Yes, the word is too small for them not to cross paths again..."
This famous 1909 Holmesian pastiche has been retranslated for the first time and includes the first 1906 Lupin-Holmes short story and another all-new story. This famous 1909 Holmesian pastiche has been retranslated for the first time. The book also includes SHERLOCK HOLMES ARRIVES TOO LATE, the first 1906 Lupin-Holmes short story, and ESCAPE NOT THE THUNDERBOLT, an all-new account of the final encounter between the Gentleman Burglar and the Great Detective, written by J.-M. & Randy Lofficier. "...The book and accompanying short stories provide a highly entertaining read. The book as a whole combines a strong mystery, a villain that is so dastardly he becomes likeable..."
"One of the great heroes a century ago was Maurice Leblanc's creation, the gentleman burglar Arsène Lupin (so much more stylish than his British prototype Raffles, and so much less sanctimonious) who faced Sherlock Holmes on four occasions in his varied career. 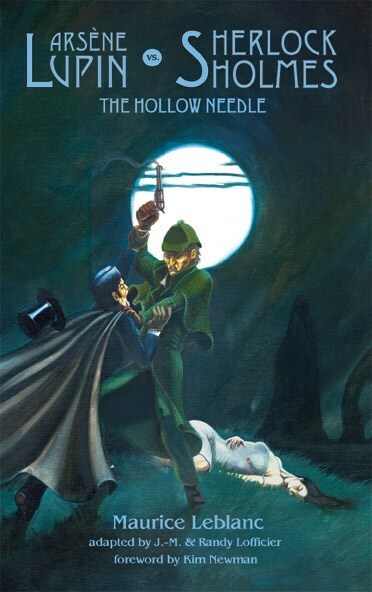 In Arsène Lupin vs Sherlock Holmes: The Hollow Needle , newly translated by Jean-Marc and Randy Lofficier ($20.95), we have the first encounter and the last between the master burglar and the master detective. The short story 'Sherlock Holmes Arrives Too Late' sets the tone admirably, pitting the mercurial Gallic intelligence of the one against the remorseless Anglo-Saxon logic of the other. There is a fiendishly difficult puzzle, an apparently impossible robbery, a touch of romance and as this is Leblanc's book, not Conan Doyle's, Lupin wins the duel of wits, but only just. 'The Hollow Needle', a short novel, is naturally on a larger scale, and, although Holmes plays a vital, or rather fatal, rôle in the story, Lupin's principal opponent here is Isidore Beautrelet, a tribute to Gaston Leroux's young detective Rouletabille. Like many of Lupin's exploits, this is essentially a treasure hunt, requiring the solution of some cunningly devised clues, but the devil-may-care character of the earlier tale gives way to a deeper and darker conclusion. To round off the book, the translators have written a brief, mellow tale, 'Escape Not the Thunderbolt', recounting a final meeting between Lupin and Holmes. They've also provided an informative afterword, and there's an enthusiastic introduction by Kim Newman. Highly recommended!"